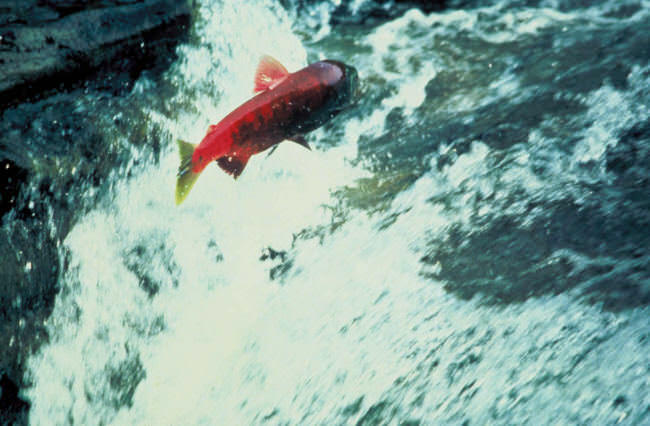 The Yes for Salmon initiative — or at least most of it — will be on the November ballot. The Alaska Supreme Court today ruled that only certain provisions of the controversial ballot initiative are unconstitutional. Whether the rest becomes state law will be up to Alaska voters. The decision guarantees a big fight ahead. The initiative is aimed at putting in place a much tougher permitting regime for projects built in salmon habitat, and is fiercely opposed by a coalition of mining and oil companies, Alaska Native corporations and other groups. The court ruled that only two of the initiative’s provisions are unconstitutional because they explicitly bar the state from giving some projects a permit, in specific situations. That goes against a section of Alaska’s Constitution, which states that ballot initiatives can’t prioritize one state resource — here, certain fish species — over others, like mines and oil developments. So the Alaska Supreme Court is ordering that those two provisions must be cut out. But the court says the rest of the Yes for Salmon initiative is good to go. Stand for Salmon director Ryan Schryver, who is organizing the campaign in support of the initiative, said he’s satisfied with the outcome. “We’re a little bit bummed that the Supreme Court removed a couple of provisions of the initiative. But they have left intact the heart and soul of what we were trying to do,” Schryver said. Lawyers for the state, who challenged the initiative in court, are also counting the outcome as a win. That’s because they weren’t arguing whether Yes for Salmon is good policy or not — they just said it violated a specific part of the Alaska constitution. Now that the Supreme Court took out the unconstitutional provisions, the state’s narrow legal challenge ends. “Our role as the attorneys for the Division of Elections and the Lieutenant Governor’s office is to ensure that no measure that violates article 11, section 7 [of the Alaska constitution] reaches the ballot. And so we succeeded in upholding that mission today,” said Elizabeth Bakalar, an assistant attorney general for the state who helped argue the case. Yes for Salmon’s opponents said the decision doesn’t change how they feel about the initiative. “The ballot measure still is just as concerning to our group and our 400-plus coalition members as it was yesterday,” said Kati Capozzi, the campaign manager for Stand for Alaska, a group formed to fight the initiative. Stand for Alaska is backed by the state’s biggest oil, gas and mining companies, like BP, ConocoPhillips, the Pebble Limited Partnership and Donlin Gold, as well as Alaska Native corporations, trade unions and other groups. Capozzi argued even in its altered form, Yes for Salmon will still have wide-reaching impacts on resource development in Alaska. “We plan to march forward, we plan to still continue informing Alaskans on the negative impacts this ballot measure will have on their lives,” Capozzi said. Stand for Alaska will march forward with a lot of money behind it — recent filings with the state show the group has raised more than $9 million over the entire campaign, including staff time. Yes for Salmon reports raising significantly less — just under $1 million, also including staff time.